For big projects and small fixes, people look for how-to videos on YouTube, increasingly on mobile. Of smartphone users, 91% turn to their devices for ideas while completing a task. See how brands like Home Depot and M·A·C are using mobile video to reach people in these 'I-want-to-do' micro-moments. Do you know how to build a treehouse? Cook the perfect pancake? Do a french braid? Neither do I. But life (and 3-year-old daughters) sometimes require us to do all of this and more in a given day. More than 100M hours of how-to content have been watched in North America so far this year. We have mobile technology largely to thank for this consumer behavior shift. Ninety-one percent of smartphone users turn to their smartphone for ideas while doing a given task.4 Being constantly connected has trained us to expect immediacy and relevance in moments of intent—the I-want-to-know, I-want-to-go, I-want-to-do, and I-want-to-buy moments. These micro-moments are the new battlegrounds for people's hearts, minds, and dollars. "Mobile has significantly changed how we connect with customers at The Home Depot," says Trish Mueller, senior vice president and chief marketing officer. "We're now laser focused on how we can use digital to deliver against our customers' needs every moment of the day and every step of their home improvement experience." Being there in these moments may be the single most important thing a marketer can do, but many aren't. Marketing is still largely planned against brand moments and milestones, and it is anchored to campaign flights and product launches—not personal moments like these. The reason for this is simple. Most marketing plans are grounded in traditional one-way media: Broadcast from brands to large audiences. Without signals of intent, traditional media makes it impossible to know whether someone actually needs or wants your product. 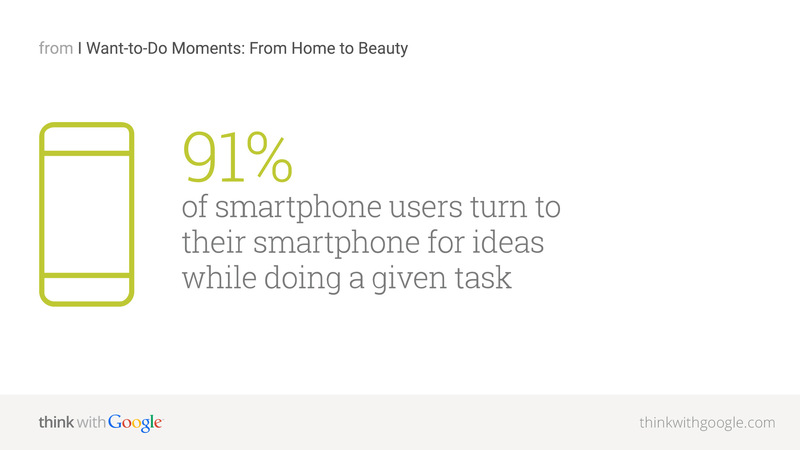 Source: Google/Ipsos, Consumers in the Micro-Moment study, March 2015. Based on the online population n=9598. Successful brands are building content strategies around these "I-want-to-do" moments. On YouTube, The Home Depot has a range of how-tos for home improvement, from outdoor projects to homeowner basics. Top paint brand Valspar's YouTube channel has content that spans from project inspiration and color guidance to painting processes and tools, helping people throughout the purchase journey. "[Seeking content] can happen early in the project for those who plan in advance, during store visits to guide purchase decisions, and even in the middle of painting a room for those who didn't prepare or want to ensure they are 'doing it right,'" says Heidi Petz, vice president of marketing at Valspar. The brand makes sure users can easily find and engage with content across screens. "Mobile is increasingly becoming the dominant way [consumers] access our content," says Petz. M·A·C has used its range of how-to beauty content to drive sales in local markets. Last year, the beauty brand partnered with Google on a YouTube gadget that allows viewers to shop directly from its "Instant Artistry" how-to video series on its local e-commerce platforms. "A user watching our videos in Brazil will engage with a version of the gadget that is entirely in Portuguese and will be driven directly to the Brazilian M·A·C Cosmetics site to purchase. We have seen fantastic engagement as well as incremental sales on e-commerce that far exceeded our expectations," says Noelle Sadler vice president of global consumer engagement. 67% of millennials agree that they can find a YouTube video on anything they want to learn. 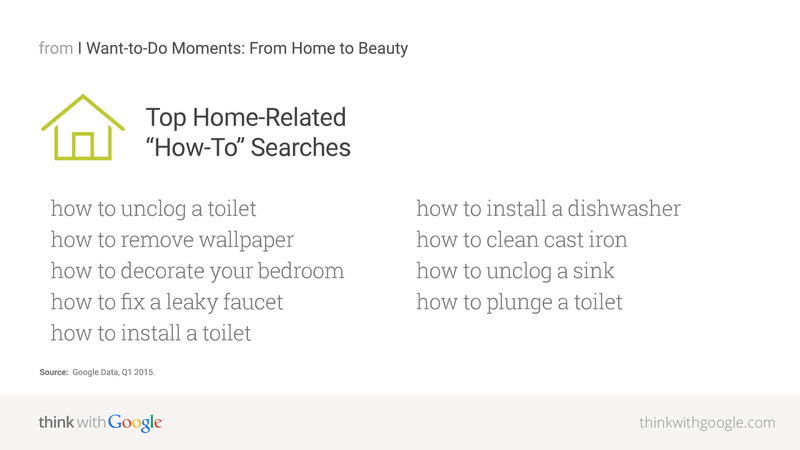 Home improvement, beauty, and cooking are among the most popular "I-want-to-do" topics.6 We looked at Google and YouTube data to see what people are looking to do in these categories. How-to searches on the hair-coloring technique "balayage" are surging, and so are "silver hair" (as people look to get in on the granny hair trend) and "man bun"7 (because women shouldn't have all the fun). 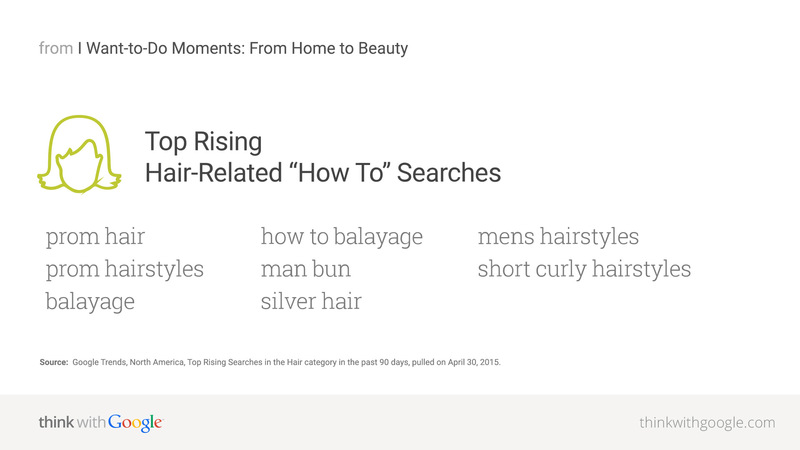 Source: Google Trends, North America, Top Rising Searches in the Hair category in the past 90 days, pulled on April 30, 2015. Millennials have driven massive growth in subscriptions to food channels on YouTube, and 75% of that growth comes from mobile devices. "Food hack" videos, which show kitchen tricks that make cooking easier (and more fun), draw interest from nearly one in four of millennials.10 YouTube creator CrazyRussianHacker, a master of the genre, has more than 4.3M subscribers. Source: Google Data, Q1 2015. Identify the I-want-to-do moments in which consumers have a need and your brand can play a role. Find these moments across the entire consumer journey and put them at the center of your strategy. What are the questions and concerns people have related to the types of products you sell or the types of projects they are used for? What do people want to learn about them? (Tools such as Google Trends and Google Consumer Surveys can help answer these questions.) Create I-want-to-do content for your website and YouTube channel to serve as resources for them. Look at when how-to searches occur. Are there particular times of day, week, or year when some topics are more popular? Make your videos easy to find by adding descriptive titles, details, and relevant tags to each video. You can also promote your content by TrueView in-stream and in-display, and you can reach the right viewers through affinity, in-market, and topic targeting. Did you reach your audiences? Did they pay attention? What implications did it have on their perceptions and actions? Measurement solutions, such as Google's Brand Lift, can help answer these questions. 1 Google Data, Q1 2014–Q1 2015, U.S.
2 Google Data, 2015, North America. Classification as a "how to" video was based on public data such as headlines, tags, etc., and may not account for every "how to" instructional video available on YouTube. 3 Google Consumer Survey, April 2015, U.S. Online population aged 18-34 n=385. 4 Google/Ipsos, Consumers in the Micro-Moment study, March 2015. Based on the online population n=9598. 5 Google Consumer Survey, April 2015. n=1128. 6 Google Data, 2015, U.S.
7 Google Trends, North America, April 30, 2015. Top Rising Searches in the Hair category in the past 90 days. 8 Google Data, North America, Jan–April 2014, Jan–April 2015. Classification as a "get ready with me" video was based on public data such as headlines, tags, etc., and may not account for every "get ready with me" video available on YouTube. 9 Google Data, North America, 2015. Classification as a "get ready with me" video was based on public data such as headlines, tags, etc., and may not account for every "get ready with me" video available on YouTube. 10 Google Consumer Survey, May 2015, U.S. Online population aged 18-35 n=1258. 11 Google Data, Q1 2015.